Today's guest post comes from our office's RD Mark McGill who has a few things to say about nutrition month here in Canada. He was rather horrified to receive his marketing materials for the month given what he felt to be a rather blatant bias. Interestingly, last week 3 other RDs approached me to ask if I would write about what seems to have become "Milk Month". "the profession's unique body of knowledge of food and nutrition and that our dealings with colleagues, associates, clients and the public [are to be] based on credibility that relies on information from solid, scientific evidence and direct experience to support decision-making"
"There is no difference between a dietitian and a nutritionist." The answer, in part, states that a dietitian is your smart choice for credible advice on healthy eating. I’m not going to discuss whether or not I agree with how the myths are answered as fellow RD Diana Chard has already taken care of that quite nicely. Instead, my focus is going to be on the blatant bias and conflict of interest that exists in the materials I was sent. These include a cover letter, a colour poster, two double-sided educational sheets for copy and distribution (one students grade 7 and up, one for adults). The cover letter was signed by Isabelle Neiderer, RD and Director of Nutrition for Dairy Farmers of Canada (DFC). Since DFC are the National Sponsor for Nutrition Month 2012 (they’ve been a sponsor in previous years, as well), I guess the fact that her name is on it shouldn’t come as a huge surprise, or that she states that in addition to the materials I’ve been sent, I can order copies of a brochure entitled “What’s True? What’s Not? Get the Real Story about Milk Products” or that if I have any questions I can email nutrition@dairynutrition.ca. What would be a surprise is if the material in the package, the brochure or a reply from DFC is "honest, fair and objective" as per the statement on the DC website. So what's inside? Certainly not "honest, fair and objective". where the "correct" answer is "nutrients". Never mind the 15.5 tsp of sugar and 360 calories per 500mL of 1% chocolate milk I suppose. "Humans may be the only adult mammals that drink the milk of another species. Eating nutrient dense milk products have helped humans survive and thrive all over the world!" Well just because we can doesn’t mean we should, and while the risks to milk consumption probably aren't particularly high, there is certainly a real body of research that links milk consumption to ovarian cancers and more aggressive forms of prostate cancer, while its benefits to osteoporosis prevention, at least according to the Nurse's Health Study, appear to be non-existent (If you're interested, here's Harvard's take on the subject). And chocolate milk? I think Dr. Freedhoff's covered that pretty well in the past. Next comes a word scramble. The first question of the word scramble has you sort out the words fattening, yogurt, healthy and less. When finished you get a statement saying it’s a myth that milk products are fattening and that eating them has been associated with a healthy body weight and less body fat. Last time I checked, consuming calorie-dense, higher sugar products (chocolate milk, fruit-on-the-bottom yogurts) contributes to the opposite, and that the data on milk and body weight is at best described as weak, preliminary and under powered, and at worst described as the product of a conflicted researcher who has patented the claim that milk helps with weight loss. "Sorry! There is no food that burns fat or makes you lose weight more quickly." Where's that statement from? 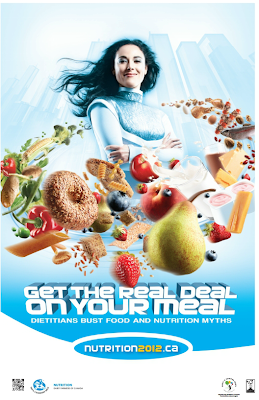 Dietitian's of Canada's Nutrition Month 2012 Myth #13. The adult sheet (entitled "Mythmania") is also awash with dairy goodness. 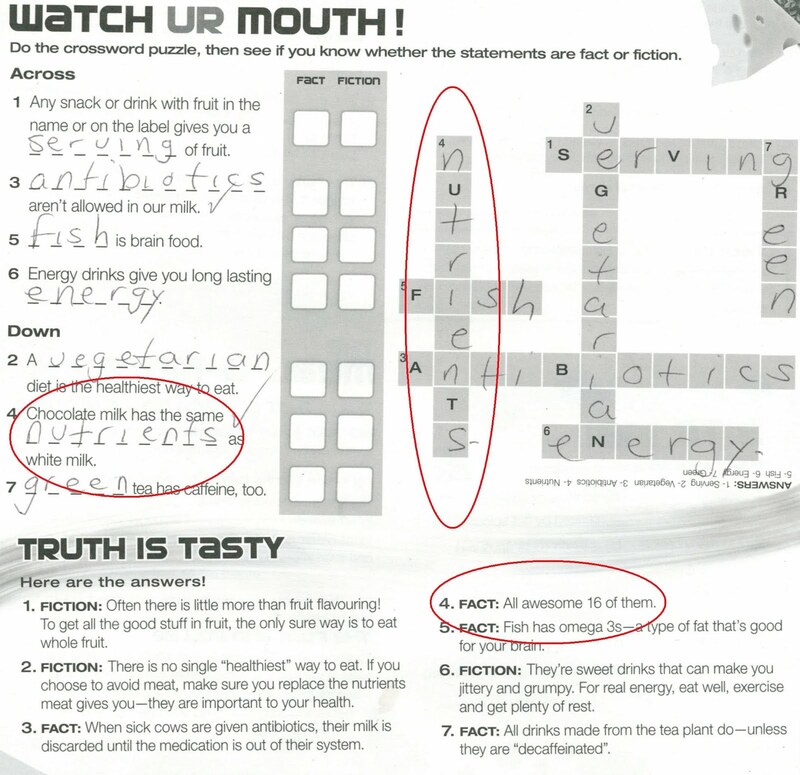 From the section entitled "Milky Madness" which addresses myths such as "milk causes mucous" to the inclusion of dairy in all three included recipes, milk is featured quite prominently. How prominently? 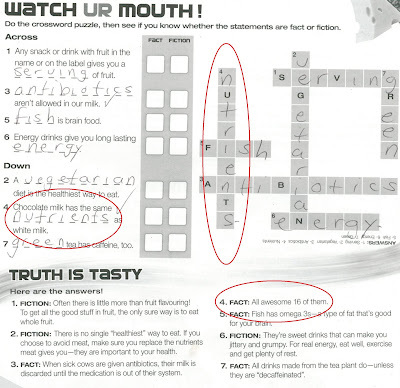 Well the handout is meant to present just a smattering of the myths from Milk Month, oops, I mean Nutrition Month's Dietitians of Canada press release. What's telling is the fact that while the Dietitians of Canada's lists 39 myths, only 3 of which involve milk, the handout I've been given by Dietitians of Canada to provide to my adult patients includes 10 myths, 5 of which feature milk. Finally, there's the poster I've been given to hang up in my office. If you squint your eyes and look hard, you'll find a few sources of protein that aren't dairy. They're up in the top right corner. That's where you'll find the entirety of your non-dairy based protein choices (nuts, beans, meats, and fish). What won't be hard to find? Milk. The giant glass of white milk splashing in the centre, the flavoured yogurts, the 3 huge hunks of cheese, and of course the chocolate milk. There's also a QR code that you can scan. It's also on all of the handouts I'm supposed to be giving my patients. Wanna guess what image you'll see when you get there? If you'd like to have a peek at the materials yourself, they're all available for download here. Suffice to say that I have not and will not be using any of these materials and encourage other DC members to do the same. Doing so goes against the principles that as DC members, we are supposed to stand for. If we truly want to be viewed as authoritative voices it is imperative that our messages this month be unbiased and trustworthy. Both of which are impossible given the large corporate influence that currently exists.